Draft: 2009, Kansas City Royals, 13th rd. Made ATL's Opening Day roster after attending ML spring training as a non-roster invitee l Posted a .381 OBP in 15 games before being outrighted to Gwinnett (AAA) on 4/25 l Elected free agency on 4/27 and signed a minor league contract with CHI on 5/8 l Played in 32 games for Iowa (AAA) before being released on 6/30 l Signed a minor league contract with ATL on 7/17 and was assigned to Gwinnett l Played in 30 games for Gwinnett before having his contract selected by ATL on 9/1 l Slashed .250/.250/.750 in 11 games for ATL in September l Appeared in 2 Division Series games against LAD as a pinch-hitter (0-1, HBP). After signing with the Braves as a minor-league free agent on 12/4/16, spent the majority of his first full season in the organization with the major league club…Appeared in 85 games and batted .275 (30-for-109) with 10 extra-base hits, 20 RBI and 10 stolen bases...Ranked fourth in the majors with 12 pinch-hit RBI...His 12 RBI as a pinch hitter were the most for a Braves batter since Brooks Conrad and Eric Hinske both had 12 in 2010...Went a perfect 10-for-10 in stolen base attempts...Became the first Braves player in franchise history to steal double-digit bases in a season without being caught while also hitting at least five home runs that same year...Batted .293 (24-for-82) with four doubles, four home runs, 16 runs scored, 15 RBI and six stolen bases after the All-Star break...Stroked his first career home run on 6/22 vs. SF, with a three-run shot over the left field wall...The three-run home run came as a pinch-hitter and also marked his first career three-RBI game...Became the first Braves player to hit his first home run as a pinch-hitter since Joey Terdoslavich did so on 6/9/15...All five of his home runs came in his final 92 at-bats, during which he slugged .511...From the date of his first homer on 6/22 through the remainder of the season, his .511 slugging percentage trailed just Kurt Suzuki (.621) and Freddie Freeman (.515) for the team lead...Had a career high-tying three RBI three times, 6/22 vs. SF, 7/15 vs. ARI and 9/29 at MIA... Became the first Brave to record his first two career hits as a pinch hitter since Antoan Richardson, who did so on 9/4 and 9/16/2011...Logged 48 games with Gwinnett across three stints (4/7-24, 5/8-6/7, 7/19-29), batting .264 (47-for-178) with 10 doubles, two triples, seven home runs, 21 runs scored, 30 RBI and 15 stolen bases...Tallied his first hit with GWN, 4/9 vs. Durham, an inside-the-park two-run home run...Recorded the fourth four-hit game of his minor league career, 4/11 at Norfolk, going 4-for-5 with two home runs...Named International League Batter of the Week for the week ending 4/16…Had a .450 average (9-for-20) with three HR, seven runs, 8 RBI and two stolen bases in five games)...Had three outfield assists in 44 games with GWN…Logged games in CF (23) and RF (21). Lane made his Major League debut on September 1 vs. Texas and played in six games with the Royals...Four of his six appearances were as a pinch runner...Selected as the Northwest Arkansas (AA) Player of the Year, batting .269 with 25 doubles, 11 homers and 36 RBI...Also tabbed a Texas League mid-season and postseason All-Star...Ranked third in the Texas League in steals (38), tied for sixth in runs (65) and 10th in on-base percentage (.352)...Hit .323 (43-for-133) with 12 doubles, a triple and 5 homers (.541 SLG) after the All-Star break...Tabbed the league's Player of the Week on June 30, batting .429 (9-for-21) with three doubles, a triple, three homers and 12 RBI in the five games during the previous week...He batted a season-best .313 during the month of June, also setting season highs in doubles (9), homers (7) and RBI (19). 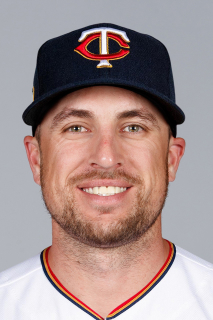 January 15, 2019 CF Lane Adams assigned to Lehigh Valley IronPigs. January 14, 2019 Philadelphia Phillies signed free agent CF Lane Adams to a minor league contract and invited him to spring training. November 2, 2018 CF Lane Adams elected free agency. October 31, 2018 Atlanta Braves sent CF Lane Adams outright to Gwinnett Stripers. September 1, 2018 Atlanta Braves selected the contract of CF Lane Adams from Gwinnett Stripers. July 16, 2018 Atlanta Braves signed free agent LF Lane Adams to a minor league contract. July 16, 2018 CF Lane Adams assigned to Gwinnett Stripers. June 30, 2018 Iowa Cubs released LF Lane Adams. May 21, 2018 LF Lane Adams assigned to Iowa Cubs. May 8, 2018 Chicago Cubs signed free agent LF Lane Adams to a minor league contract. April 27, 2018 LF Lane Adams elected free agency. April 25, 2018 Atlanta Braves sent LF Lane Adams outright to Gwinnett Stripers. April 19, 2018 Atlanta Braves designated LF Lane Adams for assignment. July 29, 2017 Atlanta Braves recalled LF Lane Adams from Gwinnett Braves. July 19, 2017 Atlanta Braves optioned CF Lane Adams to Gwinnett Braves. June 7, 2017 Atlanta Braves recalled Lane Adams from Gwinnett Braves. May 8, 2017 Atlanta Braves optioned CF Lane Adams to Gwinnett Braves. April 25, 2017 Atlanta Braves selected the contract of Lane Adams from Gwinnett Braves. February 25, 2017 OF Lane Adams assigned to Atlanta Braves. December 14, 2016 CF Lane Adams assigned to Gwinnett Braves. December 3, 2016 Atlanta Braves signed free agent CF Lane Adams to a minor league contract. November 7, 2016 RF Lane Adams elected free agency. August 29, 2016 RF Lane Adams assigned to Iowa Cubs from Tennessee Smokies. August 3, 2016 Chicago Cubs signed free agent CF Lane Adams to a minor league contract. August 3, 2016 RF Lane Adams assigned to Tennessee Smokies. July 28, 2016 Trenton Thunder released CF Lane Adams. April 29, 2016 CF Lane Adams assigned to Trenton Thunder from Scranton/Wilkes-Barre RailRiders. April 16, 2016 CF Lane Adams assigned to Scranton/Wilkes-Barre RailRiders from Trenton Thunder. April 4, 2016 CF Lane Adams assigned to Trenton Thunder from Scranton/Wilkes-Barre RailRiders. February 11, 2016 New York Yankees sent CF Lane Adams outright to Scranton/Wilkes-Barre RailRiders. February 1, 2016 New York Yankees designated Lane Adams for assignment. January 15, 2016 New York Yankees claimed CF Lane Adams off waivers from Kansas City Royals. January 6, 2016 Kansas City Royals designated CF Lane Adams for assignment. November 2, 2015 Kansas City Royals activated CF Lane Adams. October 5, 2015 Kansas City Royals recalled CF Lane Adams from Northwest Arkansas Naturals. September 27, 2015 OF Lane Adams assigned to Aguilas del Zulia. June 2, 2015 CF Lane Adams assigned to Northwest Arkansas Naturals from Omaha Storm Chasers. April 23, 2015 CF Lane Adams assigned to Omaha Storm Chasers from Northwest Arkansas Naturals. April 4, 2015 CF Lane Adams assigned to Northwest Arkansas Naturals from Omaha Storm Chasers. March 18, 2015 Kansas City Royals optioned CF Lane Adams to Omaha Storm Chasers. October 30, 2014 Lane Adams roster status changed by Kansas City Royals. September 30, 2014 Kansas City Royals reassigned CF Lane Adams to the minor leagues. September 1, 2014 Kansas City Royals recalled CF Lane Adams from Northwest Arkansas Naturals. August 7, 2014 Northwest Arkansas Naturals activated CF Lane Adams from the 7-day disabled list. August 3, 2014 Northwest Arkansas Naturals sent RF Lane Adams on a rehab assignment to Burlington Royals. July 15, 2014 Northwest Arkansas Naturals placed CF Lane Adams on the 7-day disabled list. Left wrist contusion. March 10, 2014 Kansas City Royals optioned RF Lane Adams to Northwest Arkansas Naturals. November 20, 2013 Kansas City Royals selected the contract of Lane Adams from Omaha Storm Chasers. September 4, 2013 Lane Adams assigned to Omaha Storm Chasers from Northwest Arkansas Naturals. July 17, 2013 Lane Adams assigned to Northwest Arkansas Naturals from Wilmington Blue Rocks. March 8, 2013 CF Lane Adams assigned to Kansas City Royals. June 21, 2012 Lane Adams assigned to Wilmington Blue Rocks from Kane County Cougars. March 30, 2012 Lane Adams assigned to Kane County Cougars from Burlington Royals. July 10, 2011 Lane Adams assigned to Burlington Royals from AZL Royals. July 3, 2011 Lane Adams assigned to AZL Royals from Burlington Royals. June 8, 2011 Lane Adams assigned to Burlington Royals from Kane County Cougars. April 12, 2011 Lane Adams assigned to Kane County Cougars from Idaho Falls Chukars. June 20, 2010 Lane Adams assigned to Idaho Falls Chukars from AZL Royals. July 13, 2009 Lane Adams assigned to AZL Royals from Kansas City Royals. July 12, 2009 Kansas City Royals signed OF Lane Adams.